Photographers can be extremely picky when it comes to what they're willing to keep their camera and other equipment in, and who can blame them? Cameras can be incredibly expensive, and for some people they are an important tool that they use to make a living. Regardless of whether you're a professional photographer or are very passionate about it as a hobby, you deserve a quality way to keep your camera, lenses and other items safe. This is especially true while you're on the go. If you love to hike and are fond of taking pictures out in nature, it's a good idea to have a sturdy hiking backpack that can easily carry your camera until you need it. The Poler Orange Camera Backpack has a simple, burnt orange design but is also available in navy, khaki, black and green camo. It's made of 1000D Campdura fabric, making it tough and extremely durable. It has a simple design with a leather base. 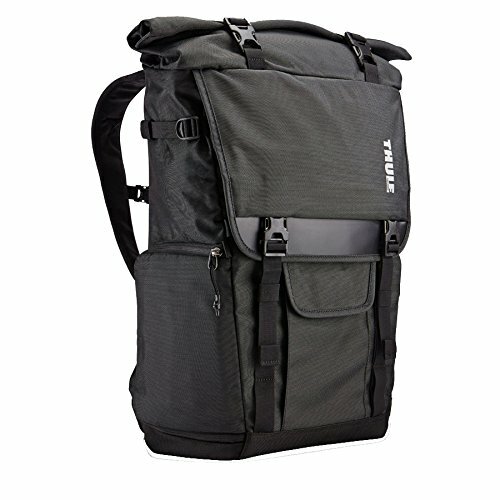 You can use this bag as either a backpack or a camera bag. There is an available camera insert system that is available to purchase separately if you need it. On the inside, there is a 420D nylon to help keep your equipment safe. The main front panel of this backpack unzips as you might expect from a standard backpack, so you'll be able to organize it as you would a backpack for school. The Poler Orange Camera Backpack has a very simple design that appears easy to use and durable. Rather than a lot of fancy accessory pieces, durability has been the main focus for this bag. This is great because you'll know you have a bag that is going to be able to handle a lot and last you a long time. With the camera insert, you'll have a nice cushioning for your camera and accessories, as well as comfortable pockets for each item which will keep them from banging against each other while you're on the move. Overall, it has a very nice design that is going to not only work well, but look great. The orange can help it to be found among other equipment, or you can go with a color that is more suited to your personal taste. The Thule Covert DSLR Backpack has a removable camera pod system that will keep your camera and other pieces of equipment safe in a well-padded environment. This system is inspired by origami and is made to be able to fold around all of your pieces in a way that provides a customized fit and a high level of protection. The Thule Covert DSLR Backpack is capable of fitting up to a prosumer DSLR body with an ultra-wide angle lens attached, that way you can have your camera ready to go when you need it. This bag is also going to be able to fit a 15” MacBook or a tablet as well as your camera equipment, so you'll be more than ready to take everything you need wherever it is you need to go. 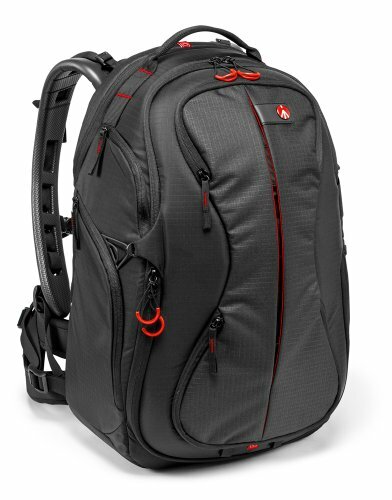 The Thule Covert DSLR Backpack is about 54.1 centimeters high and 20.1 centimeters wide. The special design of the divider system available for this bag is especially convenient. It allows you to be able to wrap up your accessories in a way that will keep them extra safe. It's a great bag that will allow you to carry everything you need with the highest level of security and fully customizable storage that a lot of other bags don't offer. There are also some smaller compartments in the front that will allow you to store any important small items that you may need to be able to reach quickly. That's really nice when you need to store keys or other items that you don't want to have to dig around in the bag for. 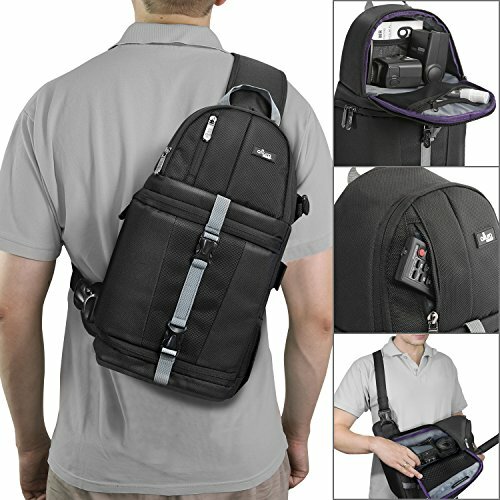 With the Thule Covert DSLR Backpack, you'll be all set for wherever you need to go. It will have an easy time protecting the objects that are important to you, and you can feel good about using it as one of your primary tools when you're on the move. The Altura Camera Sling Backpack is designed to be lightweight as well as highly durable so that you can have easy on-the-go use. There are multiple compartments that will allow you to fit your camera, accessories and other important objects. 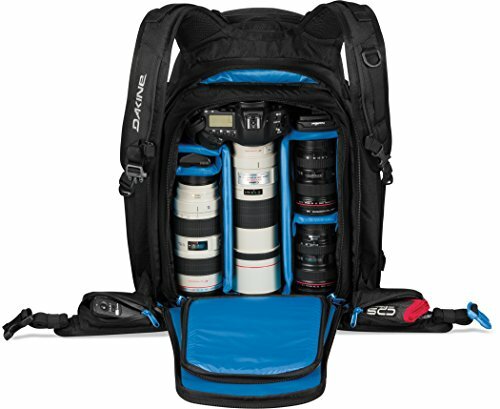 This backpack is capable of holding DSLR cameras with a typical zoom lens as well as allowing you to store extra lenses and even flash units. 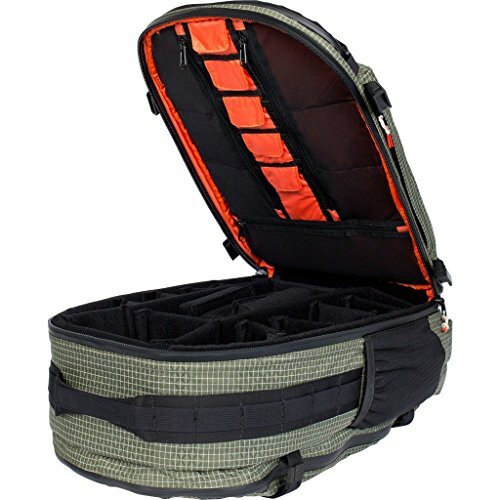 There are adjustable dividers and mesh pockets made for storing your equipment. This backpack has a sling design which allows you to bring it around to the front of your body so that you can get into it easily. The Altura Camera Sling Backpack also has a holder for your tripod, which is going to add another level of convenience when you want to be able to easily take stabilized pictures while you're out and about. There are also quick access side doors that will allow you to be able to get your equipment out more quickly during times of need. One of the key features on the Altura Camera Sling Backpack is the sling design. It provides a new way of carrying the bag which also allows you to be able to get into it quickly and easily. 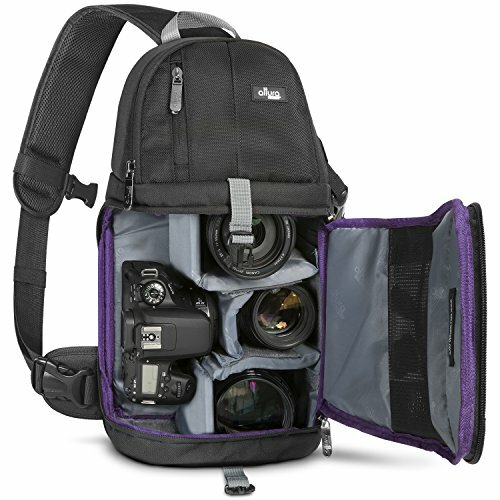 This is a great bag for when you're on the go and want to be able to pull out your camera at a moment's notice. This bag has a lot of space, allowing you to store just about anything you need inside. The Altura Camera Sling Backpack also has a 90 day, 100% satisfaction guarantee to make sure you're completely happy with your purchase. That goes to show that the company really believes in this bag and knows it's going to last you a long time, otherwise you'll get your money back. Whether you're out in the wilderness or flying towards a new adventure, this bag will surely be able to help you carry your important tools. The Manfrotto MB PL-B-220 Backpack comes with modular dividers that allow you to keep your equipment well-organized and safe. It's a lightweight bag that is designed to provide a lot of protection to anything kept inside. 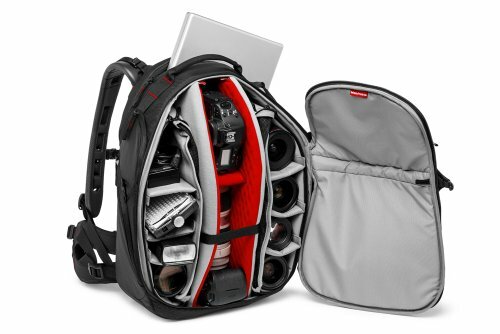 While it is light, it's capable of storing a lot including 2-3 DSLR bodies as well as up to 8 different lenses. You would also be able to fit a laptop in this bag that is 17” or smaller. Another important feature is that it comes with a unique foam harness specially designed to help keep you comfortable as you carry around your equipment. The shape of this bag is made to fit your body organically, making it a little more comfortable to carry around. It's designed to make sure you're able to carry as much weight as this backpack can hold with as little strain as possible. The Manfrotto MB PL-B-220 Backpack is capable of carrying a lot to help make sure you have everything you need when you need to take your camera as well as any other needed equipment somewhere. You're also going to be able to use this bag as a carry-on during travel, which means you can be there to make sure your equipment is treated well and kept safe. You'll also have access to your equipment whenever you need it. It's important to keep in mind that this is a larger bag and can be heavy if you fill it up, so make sure you're going to have an easy enough time carrying it under those conditions. The makers of this backpack don't want you to be under any strain while carrying it around, and have taken huge steps to be able to make that a reality and keep customers happy. Those features are going to be very beneficial when you're on the go and don't have time to stop for a massage! 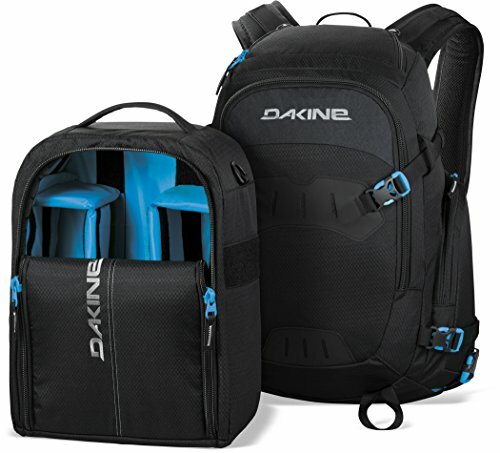 The DaKine Unisex Sequence 33L Backpack has a nice padded sleeve that will allow you to fit a 17” laptop as well as other needed equipment. There's a sternum strap that you'll be able to adjust in order to make sure you're comfortable and the weight in the bag is evenly distributed. This bag also has a rain cover that you can use to keep your items safe from rain or other damp weather. There's also a padded waist belt that can also help you with distributing and carrying the weight. The camera partitions available for this bag are padded in order to add an extra layer of safety for your equipment. Cameras can be very pricey, so there's really no such thing as too much padding to keep them safe. 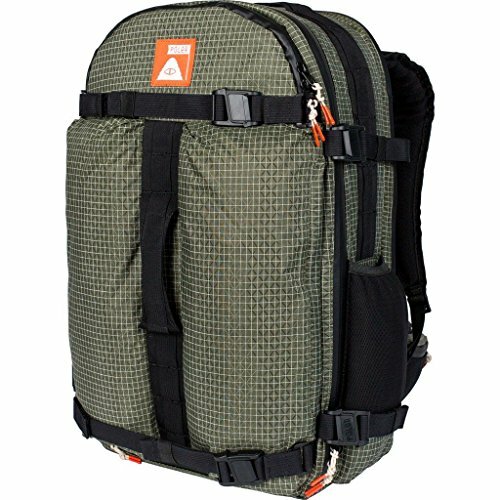 The DaKine Unisex Sequence 33L Backpack is capable of carrying a lot, and unlike many bags has multiple straps that can help you with making sure the weight of the bag is distributed well. This is helpful because if too much weight is placed on one area, it can leave you feeling sore and uncomfortable in that spot pretty quickly. It's a lot easier to carry the weight around when it sits evenly on your body. This bag is great for travel and you can keep it with you to make sure your equipment is kept safe. You also won't have to worry about wet weather because the rain cover will be able to protect your important items. This bag is designed with a strong desire to keep your items safe because DaKine realizes that there's a good chance you may be carrying hundreds or even thousands of dollars worth of equipment inside. Your bag should be built with a high level of protection in mind to protect the important things you keep inside. These are all great bags that are going to be able to help you carry your equipment comfortably and easily. It's important to keep in mind how quickly you might want to be able to get into your bag and get equipment out. For a lot of bags, your camera does need to be fully separated from any special lenses or other add-ons in order to be stored. This can be a problem if you want to be able to reach into your bag and quickly pull out your camera to take pictures at a moment's notice. It's also a good idea to consider where you're going to be using the bag. If you'll be outdoors a lot and potentially dealing with wetter weather then durability will be more of a factor than if you're going to be traveling and staying in hotel rooms. You'll also want to make sure the bag you choose is at least water-resistant, if not offering a rain cover. Overall, it's extremely important to get something that's going to be able to hold up no matter what kind of use it may be subjected to. It's important to have an idea of how you'll want to wear the backpack, because there are so many styles. There are styles that fit like a typical backpack, styles that go across the body, and styles that come with or without waist straps. It's important to know which strap setup is going to be most comfortable for you to wear, particularly if you're going to be wearing it for longer hours or carrying a lot of equipment. You want to be comfortable, and sometimes it might be important that you're able to get into the pack and to your camera quickly. If you have a lot of accessories that you're going to be needing for your camera, you're going to want to make sure you know what to expect as far as the dividers in the backpack go. Naturally, it's a good idea to keep all of your equipment separated so that there aren't pieces hitting each other as you move and everything is well padded to keep it protected. Different bags are going to have different kinds of dividers depending on the space available and what they were designed to carry, so think carefully about what you usually need to take on your trips out and try to select a backpack that will be able to comfortably and safely carry it all. This is especially important if you're going to have a lot of weight to carry because with heavy loads especially, the more evenly the weight is distributed, the easier time you're going to have carrying it around. Otherwise, if the straps are sitting the weight mostly on your shoulders, you're going to wind up with aching shoulders not long after you get moving. One way a lot of backpacks help with weight distribution is by providing a waist strap. This is a good idea if you're going to need to carry a lot of equipment.